Urban areas are an important and growing land use class. Nearly 5 % of the world is covered with urban development and residential yards make up a large proportion of that area. Yards have unique but homogenous biological characteristics and are known to be rich with bird fauna, but little is known about backyard mammals. 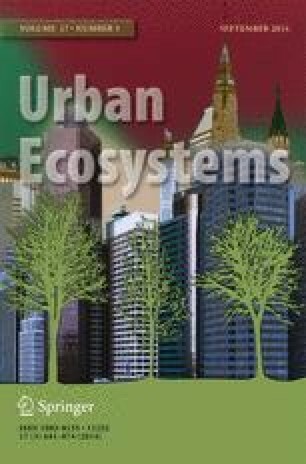 We used camera traps to sample mammal communities in backyards and urban woodlots in Raleigh-Durham, North Carolina, USA and related species activity to yard characteristics and levels of neighborhood development. We found a vibrant community of smaller herbivores and carnivores using residential yards in urban areas, but larger ungulates and carnivores were only detected on the urban fringe, or in woodlots. Backyard chicken coops were positively correlated with raccoon activity but were not positively correlated with other predators, suggesting that chicken coops are attracting raccoons, but not other predators, to yards. Fenced-in dogs were negatively correlated with most mammals suggesting that confined dogs keep mammals out of yards. Unfenced dogs and fences without dogs, showed a more varied relationship with mammal activity. These results show an encouraging sign of how humans can coexist with wildlife, even in urban areas, and suggest some strategies to minimize conflict regarding backyard chicken coops and dogs. We thank all of our 49 volunteers for participating in this study. We also thank Rebecca Owens, Holly Menninger and Ally Stewart for their field assistance and volunteer coordination. We also thank Robert Montgomery for his statistical advice. This work was conducted with funding from North Carolina State University, the North Carolina Museum of Natural Sciences and the National Science Foundation.